Catch Up® lunchtime seminar in South Wales! 21st March 2016 - Catch Up® lunchtime seminar in South Wales! On a sunny day in South Wales, March 18th 2016 (Sports Relief Day, to be exact! ), Llanhari Primary School opened its doors to members of the Catch Up® Community from across the region. 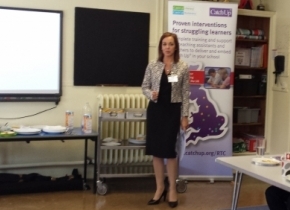 Mrs Emma Coates, Headteacher, hosted the first ever Catch Up® lunchtime seminar in South Wales! The session was attended by both new and old ‘friends’ of the Catch Up® interventions and, following a delicious lunch, we were able to ‘catch up’ with some good practice from two Catch Up® Excellence Award-winning schools – Llanhari Primary School and Jenner Park Primary School, Barry. Finally, we considered how any school could adopt the good practice, and how Catch Up®, the organisation, supports each and every school.